Last week Brandy, over at Brandy's Bustlings, was kind enough to think of my lil ole blog for the Liebster Award.....thank you very much, Brandy! Brandy has won a place in my blogging heart as she simplified things, just a bit, and only posed five questions. She also based things, loosely, around D.L. Hammond's great Blog Blitz idea...which is where she got her nominees, as well. 1. If you have published a book (most of these nominees have, some more than one), describe in three words how it felt that first time? If you have not published a book, how do you think it would feel? I haven't published a book....yet. But, when I do, I have no doubt it will be one of the highlights of my life. It's always nice to see your efforts come to fruition. 2. Have you taken part in Blog Blitz before or is this your first time? This is my first rodeo, yes. 3. Have you ever run a contest/blog hop from your blog? No, but you know I've been thinking of doing one for a while now. I think the whole process of writing is very interesting and, even more so, where people write. I'd like to do a hop highlighting what everyone's "writing spot" looks like....pictures, descriptions, etc. Hops are a lot of work, but maybe I'll organize it and give it a go, here soon. Thanks again, Brandy, I appreciate you thinking of me! 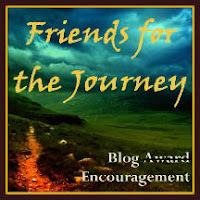 The lovely and talented Sheena-kay Graham, from Queendsheena, also gave me some kudos in the form of the Friends for the Journey Blog Award Encouragement. No real strings attached with this one, just passing it along and recognizing fellow bloggers is the gist of this one, it seems. It's nice to have such great blogging buddies and their encouragement, in any form, really does help , so thank you again, Sheena! I'd like to forward this one on to five other blogging pals who, I think, need more blogging pals of their own. Dee at DeeCoded. Dee is all over the place, in terms of her blog, but she's always entertaining and I always enjoy seeing how things are in her corner of the world. Jennifer over at A Creative Exercise. A focus on writing, but also this and that from here and there. The Capillary, located in England, always has an interesting take on things. Jasmine at A Yellow Rose of Texas always has fun and interesting topics and you never know just quite what you're going to see over there...in a good way. Rebecca Green Gasper A YA author who is always looking to raise awareness on issues affecting young people. So, if you get a chance, drop by these great gal's blogs and show them some encouragement! And, for a quick Music Monday selection, here's something to help get the blood pumping...some Billy Idol and a "Pop Up Video" version, no less. Lots of fun things here, Mark! I too am very interested to see what everyone's work space looks like! Such a neat thing that so many different people can all be linked with our passion of writing. Love it. Congratulations! You should organize your own hop. They are a lot of fun. Trust me! I think my husband's monitor is that big. Mine is definitely smaller. That is a big screen to look at. Don't know if I would want to see my mistakes that big. It's always so nice when another blogger sends you an encouraging award. Congratulations! Congrats on the nods and good choices for passing the encouragement along. I'm a big Fantasy and SciFi guy, too! Your enthusiasm for the forms really showed during the A-to-Z Challenge. @Susan: It helps when trying to read the small print, though! @Julie: It sure is, no doubt! Congratulations on your awards. You will write your books and become a celeb. And then they will ask you to dance on DWTS. Hi Mark - congratulations on the award .. and you will write your book and be published .. it's that dream with a goal .. The 32" monitor sounds so good - I downsized my large screen - and hope I can upgrade soon .. it does make it so much easier on the eyes. I can't keep up with blog hops - I manage the Challenge and then I just toddle along! 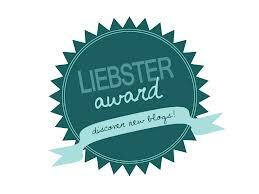 And to those blog links I shall do ..
Glad you enjoyed the award I gave you and congrats on winning the Liebester Award. Lovely and talented, oh Mark you're making me blush. Fantasy is a lovely genre, glad to see we're both big fans. @Hart: Thank ya and I hope I have the stamina to keep up! @Sheena: Haha...yes and thanks again! @mshatch: An oldie, but a goodie. Man, I never thought I'd say that about Billy Idol! Always good to discover new blogs. And all these blog hops and blogfests and blog parties and even a blog blitz. Now why didn't I think of that! Congrats on the award and congrats to all those wonderful folks you bestowed it upon. I shall, time permitting, check out your links. A 32 inch monitor is so cool! I'm ready to pull the trigger. I think a payment plan with QVC would work. I may do just that in the next couple weeks. I imagine that getting published would be a highlight for any of us unpublished writers here too! Congratulations on the award, Mark. @Gary: Thank you my friend and, as always, your comments have given me a good chuckle :) Have a great Wednesday, yourself! Congrats on the awards! And ALex is right, you should do a blog hop or blogfest... I've done a couple of Harry Potter themed ones and had a ball. Terrific choices to pass on the awards. Rebecca in particular is an amazing person! Congrats on all the props friend. And I rock a giant screen too. I'm totally blind! Larger screens are always great. I am excited for the day you publish a book. As much fun as I have reading your blog I know I'll love to read any of your books. @Celeste: Thank you and it could be a lot of fun, for sure! Congrats on the awards! I think you idea for a blog hop is great! Let me know if you need some help or a co-host or someone to spread the word.